Ozzy is not amused by all this talk of pumpkin-flavored dog food. The dogs finished off their last batch of homemade food yesterday, so I had to throw something together in a hurry. I decided to try a seasonal Halloween version of the “Have-a-Hearty Hound Loaf,” which basically consists of a base of mashed tofu and/or beans, dressed up with various goodies (Italian Tofu Styley, anyone?). This time around, I mixed mashed tofu with pureed pumpkin, black beans, ginger, cinnamon, dried apples and cranberries, and a bit o’ carob chips to give the loaf an orange/candied feel. My initial instinct was to use a sweet potato puree in place of the pumpkin, but little Miss Rennie doesn’t seem to care for sweet potatoes, so I decided against it. (I made a sweet potato soup/gravy for them a few weeks back, and she so disliked it that I had to make an extra dish of mixed veggies and beans just for her. Hmph!) But you can sub in sweet potatoes if you’d rather. Also, I was running a little low on pumpkin puree; I thought about mixing in some rolled or quick oats, but didn’t want to dilute the pumpkin flavor too much, so decided against it. 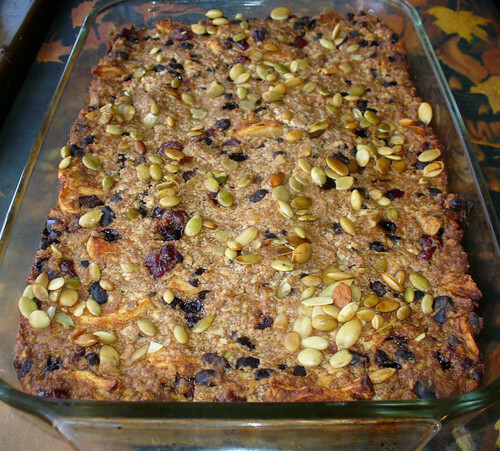 Add extra pumpkin and oats if you’ve got ’em – don’t be shy! This dish is meant for the dogs, but you can probably play around with the seasonings and spice it up to your own liking. The finished loaf holds up well, retaining its shape and integrity, even though the center is rather moist and crumbly. The dogs sure like it, and as an added bonus, it gives off a very autumnal odor that will linger for hours – until well after you’ve cleaned the dishes and stashed the leftovers in the fridge. 2. Drain the individual bricks of tofu and place in a large mixing bowl. Wish a hand masher, mix and mash the tofu until it’s relatively crumbly. A few intact, medium-sized cubes of tofu are okay. 3. Add the pumpkin puree, cinnamon and ginger to the mashed tofu and mix well. Add extra pumpkin and spices to taste. 4. Drain and rinse the black beans and add them, along with the cranberries, apples and carob chips, to the tofu/pumpkin base. Mix well. 5. Lightly grease a glass baking pan. Transfer the tofu/pumpkin mix to the pan, packing it in and evening out the top with your spoon. Garnish with pumpkin seeds. 6. Bake covered at 350 degrees for 30 minutes. At the 30 minute mark, remove the cover and bake for another 30 to 45 minutes. 7. Serve warm, and be prepared for sloppy, gingery doggy kisses for the rest of the night! * Please check out the Dog Food Disclaimer page if you have any questions or concerns, or before trying any dog food recipes on this site! This entry was posted on Sunday, October 25th, 2009 at 2:27 pm. You can follow any responses to this entry through the RSS 2.0 feed. You can leave a response, or trackback from your own site. I think I’m going to make this & put a bit each day on top of their kibble. I wish Emma’s stomach wasn’t so touchy! It looks like something she could handle in small amounts, though. Great recipe! I actually just ran this through a food processor; Rennie started throwing up bile and seeds Sunday night, and when it happened again last night, we put two and two together and figured that she was having trouble digesting the pumpkin seeds. She’s a tiny dog, just 15 pounds, and the seeds are probably too big for her. None of the other dogs had an issue. Anyway, I processed it in batches, so the seeds are finely ground now. Hopefully this will do the trick; maybe the same would work for Emma? As for people – I think this recipe might make a yummy spread when processed. It looks a lot like hummus, and has a nice cranberry-pumpkin-ginger taste. I think I might try it on toast later today! @ Ashley – Awww, so cute! 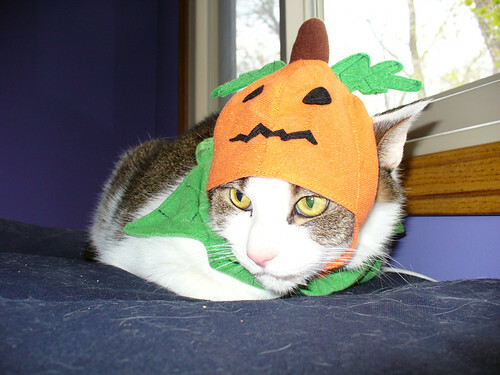 I love dogs and cats in costumes. Probably a little too much!